No, this is not me on the psychiatrist’s couch. I’m far too much of the stereotypical man to admit there’s actually something wrong to another human. However, lying on my own couch with smartphone in hand, I’ve decided to reveal all… to a Woebot. 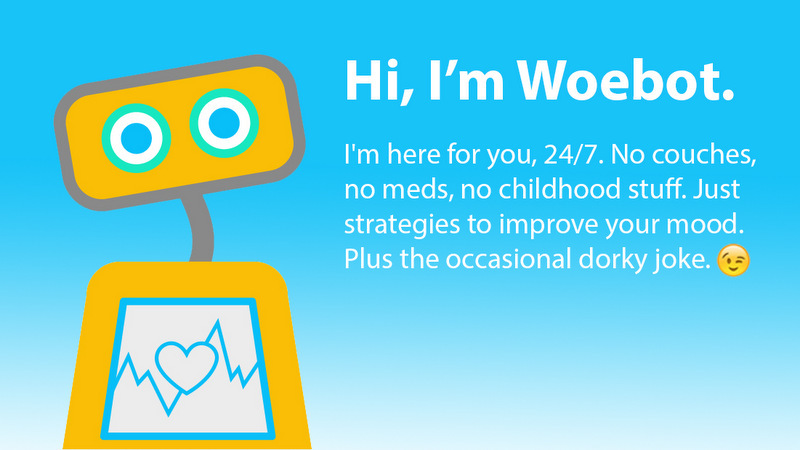 Woebot is a digital service available on iOS and Android smartphones. The application is designed to assist people in dealing with personal or mental health issues such as anxiety and depression. The artificial intelligence (AI) robot in the app does not aim to treat or diagnose, but rather “reframe negative thoughts into solvable problems with Cognitive Behavioural Therapy (CBT)”. 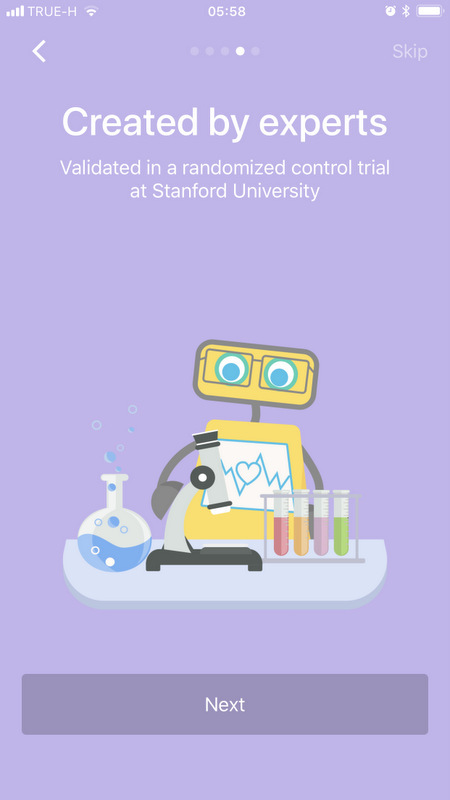 According to the company behind the app, Woebot was created by leading experts in clinical psychology and has demonstrated ability to make people happier. Certainly, the presented user quote on their website affirm the statement. 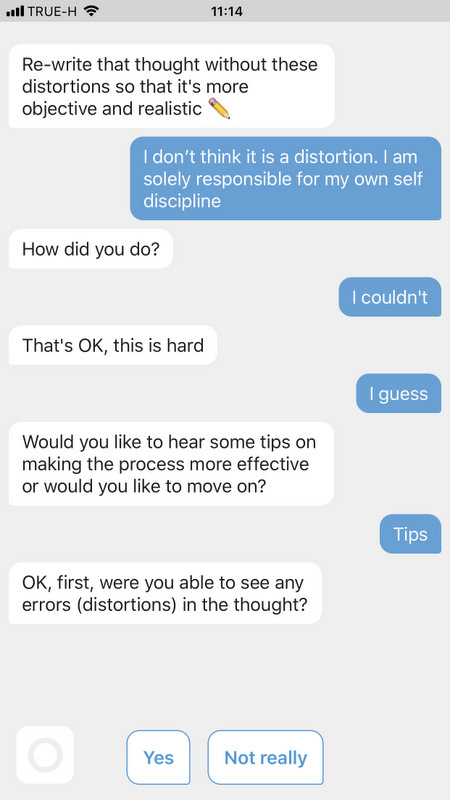 Having been intrigued enough to download the app I soon sniffed that our overtly friendly host was never going to pass The Turing Test. It’s immediately obvious this is a queries-based point-and-click adventure into therapy, and certainly not an evolved AI Q&A style setting. This compact digital helper is not sophisticated enough to generate its own reasoning based on the statements provided by its human client. Instead it assimilates a person-centered psychotherapy response based on branching questioning. 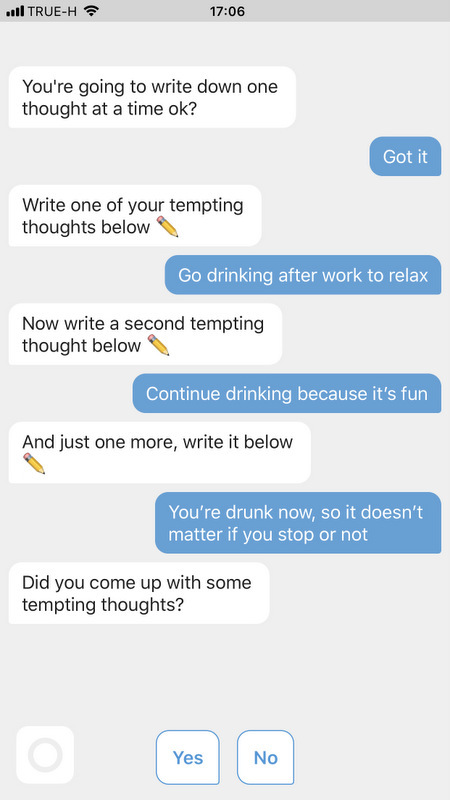 The app’s anthropomorphic chatbot puts on its best human facade to facilitate our self-actualising tendencies via acceptance and empathetic understanding, rather than detailed personal analysis. But could this approach be a source of ongoing support to the needy in an era of stretched medical resources? Me, well, I’m not so sure. So I’m setting the little chap a minor task – curing a lifestyle journalist of all indulgent behaviour and addictions, fuelled by the need for social attention and critical endorsement. What could be simpler? What is clear is that Woebot is a polite robot with traditional values, and prefers a slow introduction and getting-to-know-you period. You can’t jump straight into bed with a “My life’s falling apart around me and I’m desperately needy of you” style approach without it kindly referring you to more professional help and services. So progress is slow whilst the binary doc learns the pattern of your needs and therapy requirements. Pleasantries out of the way, the therapy bell rings out for Round 1. Woebot asks me to outline areas of focus. I reply by writing three statements identifying issues that I believe to be out of control or feel a need to change. The Woebot then asks me which of the three I would like to work on first. That’s a bit like a bomb disposal team asking you which wire to cut. Close your eyes tight and take yer pick. 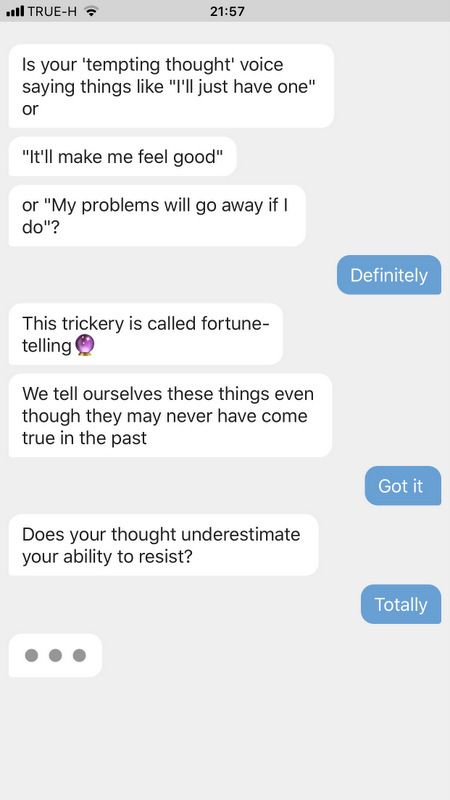 What is apparent from this point forth is that the bot works by focusing on each of the user’s statements, producing a modular question-and-response style dialogue where the individual themselves identify through the branching questioning what type of cognitive distortion is the underlying cause of their disquiet. This approach enables the user to spot the errors in their reasoning that either establishes or endorses the behaviour they would wish to change. Woebot: Is your ‘tempting thought’ voice saying things like ‘I’ll just have one” or “It’ll make me feel good”? So now I’ve openly presented my woes to the world AND I’ll be unemployed by the time you read this. Woebot! It’s fair to report that Woebot does present to the user-in-need a very introductory approach to the ideas behind CBT, and how established poor decision-making processes need to be identified and changed in order to make better choices in our lives. On the other side of the couch, this approach provides little flexibility in the response structure, which can prove to be frustrating to a person wanting more depth in response to an acute and very real issue. A more sophisticated AI would detect that I wasn’t always agreeing with the Woebot’s statements, and rather than forcing the user down a primitive line of deduction, it would identify the need for re-evaluation. In fairness, perhaps Woebot needs more time investment to develop the quality and effectiveness of the relevant techniques and therapies, but my fear is if it’s so predictable in the early sessions, will patients be interested in developing a deeper relationship with this techno-therapist? My hunch is Woebot would soon be collecting digital dust. As for me, it’s clear we are all still in need of a little human touch. I might as well go straight back to the bar and feel a whole lot better then… oh, hold on a minute, that statement included ‘minimisation’ and ‘fortune-telling’ thinking. Hmm… perhaps I’ve learnt something after all.